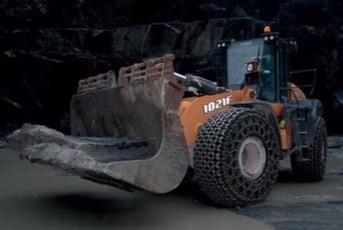 Proven reliability and performance combined with reduced ownership costs were key reasons for Burlington Stone choosing a Case 1021 F Series Wheel Loader Burlington Stone, one of the UK’s leading natural stone and slate producers has increased its quarry and earthmoving equipment fleet of Case machines to 10 with the addition of a new Case 1021 F series wheel loader, supplied by local Case dealer Dennis Barnfield. Burlington’s machine operators have also been impressed with the 1021F especially the new cab layout, which provides excellent visibility, and with Case’s joystick steering system which is integrated into the left hand armrest, repetitive loading duties are a much easier task. There is also the optional rearview wide- angle camera, which has a live feed to the colour monitor in the cab for additional security and improved safety on site. Case Construction Equipment sells and supports a full line of construction equipment around the world, including loaders/backhoes, excavators, motor graders, wheel loaders, vibratory compaction rollers, crawler dozers, skid steers, compact track loaders and rough-terrain forklifts. Through CASE dealers, customers have access to a true professional partner with world-class equipment and aftermarket support, reliable warranties and flexible financing.